Free beer! Free food! 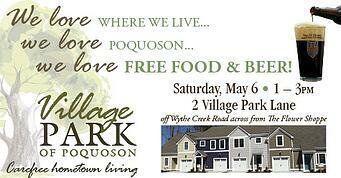 Join us on May 6th from 1-3 at Village Park, the newest Wayne Harbin Builder community in Poquoson. St. George’s Brewery will be pouring their craft beer and The Thirsty Frog food truck will be serving some delicious eats! Out of 26 units, 6 have already sold and 3 are reserved. Don’t miss out on this flood insurance free living in Poquoson! Special incentives for a limited time. Call the Village Park team at 757-873-2707 for more details.